What's in the box this week? Clockwise from lower left: French breakfast radishes, broccoli raab, lettuce, spring onions, broccoli, parsley, grapefruit, "Ponkan" tangerine, avocado. You'll notice you only see one Ponkan there. There were two in the box, but one didn't even make it home because Little Miss F devoured it within about five minutes. Glad I got a picture quickly because No. 2 is now gone too. 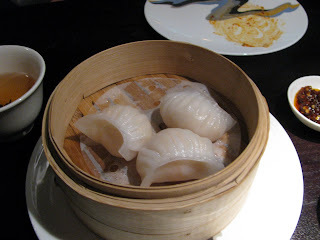 They were sweet with nice texture, though not terribly juicy. It's apparently an Asian varietal, also known as the Chinese honey orange or Chinese honey tangerine, and it's grown extensively in Florida. Some more information here or here if you desire further reading. The radishes have also been good for snacking, this time sliced thin and scattered over buttered toast, and sprinkled with some coarse sea salt (a minor variation on the radishes/butter/salt theme). The lettuce loooks hale and hearty, as does the parsley. I see salsa verde in my future, though the open question is what it will go on top of. And I love those spring onions too, they're great just sautéed or roasted, with a vinaigrette or a romesco over them (or I could grill them and pretend they're calçots). Nothing revolutionary to report on the disposition of prior weeks' produce. 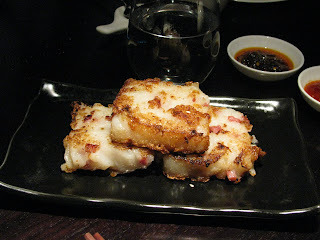 Many different greens have been cooked off with some jowl bacon. Cabbage has been cooked with butter and bacon, and paired with some nice white trout that was pan-roasted with some lemon and garlic bread crumbs. Tomatoes became a very lazy variation on pan con tomate (bread toasted, drizzled with olive oil and rubbed with garlic, tomatoes cut and rubbed onto the bread). 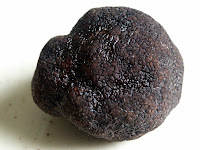 Canistels and black sapotes have ripened, been harvested and are waiting in the freezer for something to happen to them. The more I did my homework on the canistels that came with the Week 6 CSA drop-off,[*] the more convinced I became that a flan was the direction to go. The fruit is also known as the egg fruit because when ripe it has a vivid yellow-orange color, and the flesh is supposed to have a texture similar to hard-boiled egg yolk. 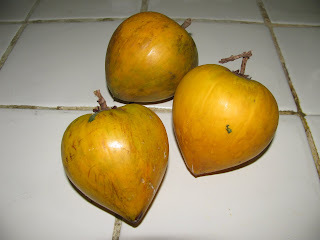 It is of the same family as the mamey sapote and bears similarities both in shape and in flavor. When I tasted a bit, I picked up some of the "egg-y" flavor (reminiscent of a Chinese custard bun), plus sweet potato or pumpkin and almond notes similar to those in mamey. Like the black sapotes we've gotten in other weeks, canistels must go very soft to be fully ripe, and the fruit bowl of late has been looking like something out of a Peter Greenaway movie (I should have taken a picture). Of course, they rarely cooperate by ripening simultaneously, so I harvested the flesh of these as they ripened and froze it until they were all ready. Fortunately, Little Miss F liked the flavor of the canistel much moreso than the black sapotes (she's a big fan of mamey) so I had a willing assistant in preparing this. 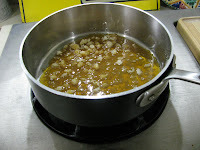 Next, the caramel. 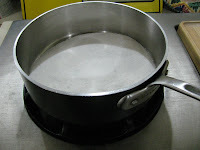 Put the 3/4 cup sugar into a saucepan over medium heat. Some recipes I read said stir constantly. Others said leave it alone until it starts to melt, then stir only occasionally. I eventually learned the latter instructions were the right ones. Just leave it be until the sugar starts to melt, then stir occasionally with a fork to incorporate the rest of the unmelted sugar. I stirred too early and ended up with big lumps that took longer to dissolve. After about ten minutes, you should have liquid (molten! 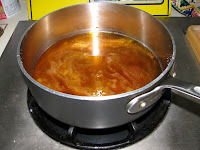 be careful) golden-brown caramel. I've made clear before my unkind feelings about Florida avocados. Another arrived with the Week 7 CSA delivery, and when it ripened this weekend, I decided to pair it with something that many other people have equally strong feelings about: sardines. 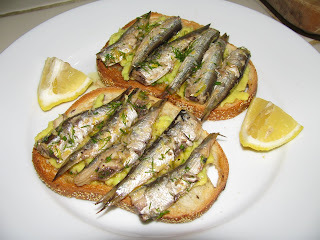 The inspiration was Alton Brown's sardine and avocado sandwich recipe featured on a recent episode of "Good Eats" (though on the Food Network website it goes by the more demure "Sherried Sardine Toasts"), which you can see more of here. Of course, I actually have Oswald Cobblepot 's fondness for silvery fish, so I had no particular aversion to the sardines, though I've always eaten them fresh rather than the ones from the tin. The mise en place: brisling sardines packed in olive oil; a couple slices of good bread; one Florida avocado (a "Brooks Late Avocado," per the newsletter), some dill (substituting for the parsley called for in the recipe), and a lemon; off stage are sherry vinegar, pepper and coarse sea salt. I halved the recipe on the Food Network site since nobody else in the house wanted to share with me. Here's a closeup of the little buggers. You begin to understand the expression. I'm dubious that you could lose fifty pounds by eating this, as Alton Brown says he did (in fairness, there was a good bit more to his agenda) - unless of course you hate sardines and won't eat them - but I thought it was a genuinely delicious use of both sardines and (the dreaded) Florida avocado. 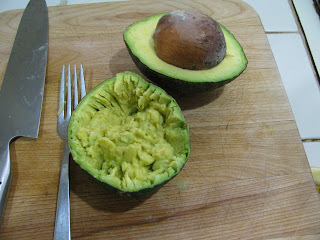 This particular avocado was less watery and insipid than other Florida avocados I've had. I'm still not sure whether it would stand up to being the star attraction in a dish, but as a complementary note to another strongly flavored item (i.e. 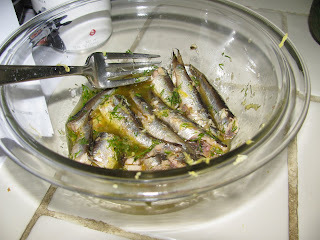 the sardines) it worked well. 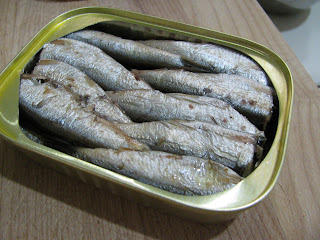 I'm not sure whether this will make a convert of any sardine-loathers out there, but it's worth a try. And for those who need no such conversion, it's a good quick snack to add to the repertoire. What do we have here? Working clockwise from top left, a bunch of cilantro, celery, a bunch of white chard, a few more canistels, a couple tomatoes, some oyster mushrooms, and in the middle, a green pepper and some mizuna. While the pickings may be a little slim as the farms recover from the freeze, the quality actually looks quite good. The greens in particular are looking very happy. On a related note, now that I have started immediately putting my greens and the like in plastic bags, I've found the shelf life has improved dramatically, and most things are remaining hearty and hale for most of a week, sometimes more if they stick around that long, before getting droopy. Coming next: a positive Florida avocado experience, and an eminently successful canistel experiment with the Week 6 fruit. I told you, Starbury, it's not that kind of truck party. Go back to China. 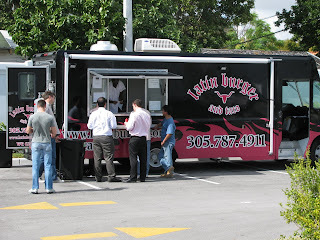 Anyway, as I drove south on Biscayne Boulevard, it gleamed like a shining beacon from a block east: the gastroPod! The gastroPod is Chef Jeremiah Bullfrog's mobile foodmobile, a converted 1962 Airstream trailer retrofitted with a high-tech kitchen to crank out some gourmet street eats. I got a preview sampling of some of the gastroPod menu at a Cobaya event we did a couple months ago, but this was my first chance to actually pay a visit to the Silver Submarine. 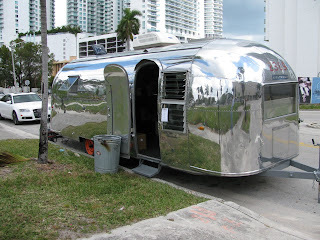 Though the gastroPod was set up near Biscayne Boulevard and 18th Street for the day, the vintage Airstream trailer would fit right in along the more northerly stretch of Biscayne whose "Miami Modern" architecture earned it the designation as the Biscayne Boulevard Historic District. The guts of the gastroPod, though are completely 21st century. 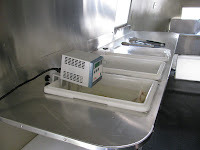 Along one side is a station rigged for an immersion circulator for sous vide cooking (he's got one running with room for more); along the other is a CVap Cook and Hold oven, another wonder of contemporary technology that uses a combination of air and vapor heat to hold foods at specific temperatures without drying out or overcooking. 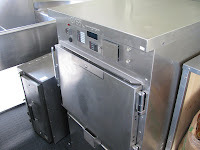 Eventually a couple CVap warming drawers will be installed underneath the area set up for the grill. 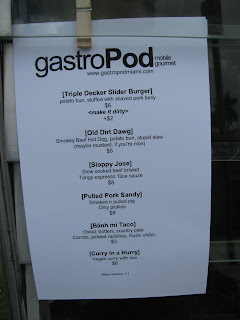 Having already had a burger at Latin Burger, I went in a different direction with gastroPod and started with the "Old Dirty Dawg." No ordinary hot dog, this one is home-made of beef short rib which is ground, stuffed into a wide casing, and then smoked. 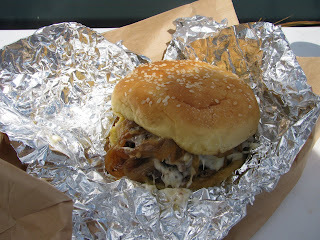 It is just loaded with flavor, and has a nice snap and a good meaty bite to it. Chef Jeremiah gives it a shmear of mustard "if you're nice" and then tops it with "stupid slaw," which Chef told me has "something like ten different ingredients." I couldn't figure out ten, but I could detect at least a couple different kinds of cabbage, carrots, possibly some beets (though it could have been red cabbage), possibly some red pepper, all with a lightly vinegared tang and whiffs of spice (turmeric giving the cabbage a neon-yellow hue?). 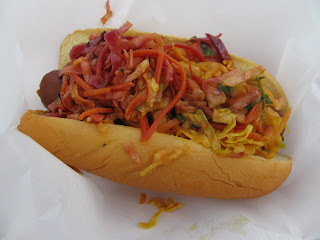 The slaw was the perfect contrast to the smokey dawg, and I liked the Martin's potato bun too which was soft without being mushy. 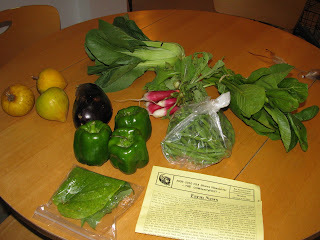 As a result of travel and other distractions I've sort of fallen off the wagon with my CSA updates. There's not been anything revolutionary going on in the kitchen anyway, so you're not missing out on much. Possibly my favorite item from the Week 6 delivery were adorable French breakfast radishes, pointy little guys with a pinkish-red blush on one end and white on the other end. They needed nothing more than some good butter, good salt, and good bread. 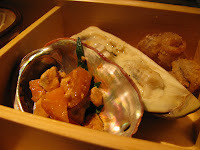 The betel leaves were used in a successful repeat preparation of the bò lá lốt, with bok choy leaves serving as an effective substitute wrapper when the betel leaves were used up. The canistels from Week 6 finally ripened (like the black sapotes, they need to be really soft - seemingly ready to be thrown out - before they're ripe enough to eat) and I've harvested the flesh on these which is in the freezer, potentially turning into a flan this weekend. A word of warning - I wouldn't use your best knife with these, the skin has a sticky substance that really doesn't want to wash off the blade. Nothing particularly exciting happened to the rest of Week 6. 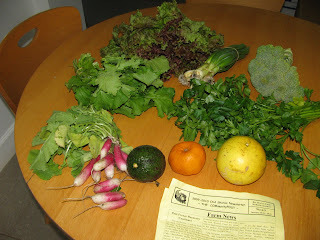 I was out of town this past weekend and Mrs. F did the pick-up, so no picture of Week 7 (though Redland Organics has the newsletter online). This was the "freeze" week. 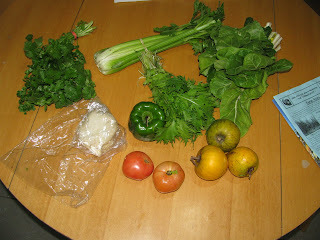 While the greens and cabbage looked none the worse for wear, the citrus was spotty - and sour! Unfortunately the carambola was too. Mrs. F cooked off the kale with some andouille and white beans, and it was delicious. I've got some more ideas for the black sapote. 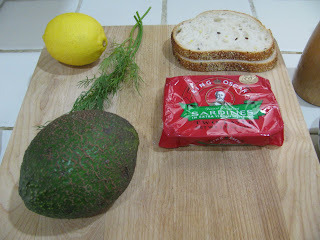 And the avocado may get used for a sample of the Alton Brown "sardine and avocado sandwich diet." It will be interesting to see how much the cold snap is going to affect the rest of the season's harvest. There are few restaurants I can think of that are so simultaneously in the moment and rooted in tradition as Cochon. With nose-to-tail dining and in-house charcuterie all the rage, Cochon's menu appears to be all over the latest trends: pig ears, rabbit livers, boudin, pork cheeks and ham hocks abound. Yet for Chef Donald Link, who also runs the more upscale Herbsaint, all of this is really nothing new: for him, this kind of whole hog dining descends in a not-too-crooked line from his family's Cajun, and ultimately Germanic, traditions. 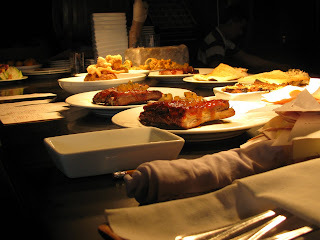 [*] We stopped into Cochon for a late lunch during our New Orleans visit and got some prime seating - the "Chef's Counter" in the back of the long, wood-paneled space, just to the side of the pass and the open kitchen - where we got to drool over every dish as it went out. 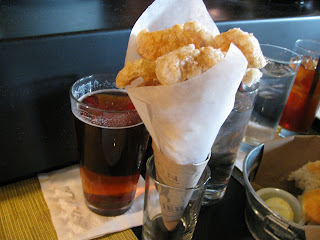 In addition to bread, Cochon serves fried pork rinds, with a little cane syrup for dipping. How can you not love the place? And yes that's a beer with lunch. I was on vacation, and it was at least 2pm. It isn't your concern. The oyster pie seems to be a Cajun tradition, with lots of oysters cooked down with the Cajun "trinity" (onions, green bell pepper, celery) thickened with cream and flour to make the filling; the oyster and meat pie appears as a not-uncommon variant. In my vicarious experiences here in Miami from folks with Louisiana roots, I've seen it done either as an actual pie with a cracker-y crust (as Chef Kris Wessel does at Red Light) or, as with Cochon's, like a turnover (as Chefs Chad Galiano and Kurtis Jantz did with an oxtail pie for this Paradigm dinner). The filling of this oyster and meat pie was dense and loaded with flavor, and I liked how the oysters made the flavor transition from briney and seafood-y to rich and meaty, more like the umami-rich dark Chinese oyster sauce than like fresh oysters. The crust was flaky and buttery with just the right amount of crisp on the exterior. The single most unexpected and intriguing bite I experienced in New Orleans may have been the first one I had at Dante's Kitchen. 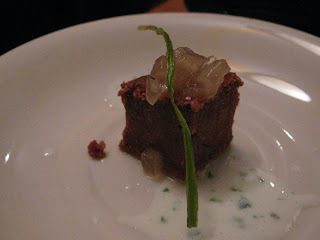 It was an amuse bouche: a cube of a beet and chocolate cake, resting in a puddle of a creamy buttermilk dressing, topped with translucent cubes of an onion jam and a little sliver of chive. It seemed an unlikely, almost perverse, combination. Not that nobody has ever done a beet and chocolate cake before; but unlike many of these, which are premised on the notion of "sneaking" vegetables into other foods (as if they are so loathsome that they must be disguised), in this one both the beet and chocolate flavors were vivid and almost synergistic. This started with the roundly earthy flavor of beetroot, but with an almost fruity note to it brought out by the chocolate; the chocolately notes were also somehow made more earthy and deep from the combination. And buttermilk dressing? Onion jam? It made no sense at all, yet it worked perfectly. I loved it. 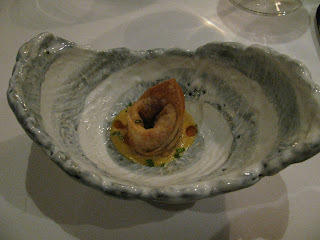 Just the mere presence of an amuse bouche was something of a suprise. 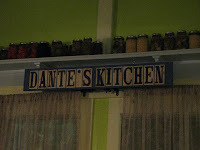 Dante's Kitchen is a casual, laid-back place in the Riverbend neighborhood of New Orleans. It's tucked into the corner of two streets in an old cottage-style house where the servers are all wearing jeans and unmatched, untucked shirts. The wooden flooboards creak and there's funky local artwork on the walls. 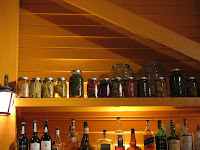 Also on the walls are jars upon jars of pickled vegetables, giving a strong hint at one of the focal points of Chef Emmanuel Loubier's cooking here: extracting all the goodness possible from the surrounding area's produce. There's no "sneaking" vegetables into anything here. 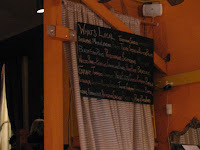 On a chalkboard as you walk in is a list of "what's local" on the menu, and there have to be at least two dozen items on the list - mostly fruits and vegetables but eggs and charcuterie as well (sorry for some lousy pictures, by the way). 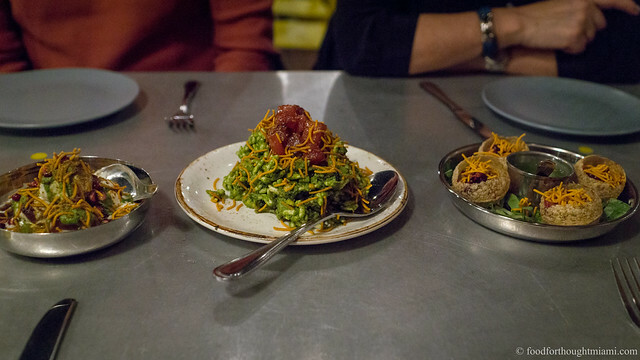 The menu features about a dozen appetizers, and maybe about half that many entrées, supplemented with a good selection of "small plates," and rounded out with about a half dozen vegetable options. 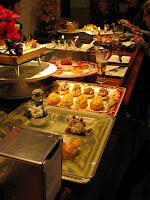 It's a great menu for grazing, which is the approach we took, ordering an appetizer, a couple small plates and a couple vegetables. I am clearly very late to the Buena Vista Bistro party. 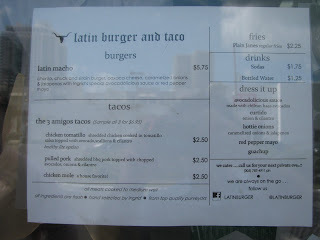 This pocket-sized little restaurant, just north of the Design District on N.E. 2nd Avenue, is closing in on celebrating its second anniversary. But somehow, despite having heard many raves for its thoughtfully priced, homey French bistro fare, other destinations in the Design District (Michael's Genuine, Sra. Martinez, Pacific Time) called to me with much louder voices whenever I was headed in this direction. We finally ignored those voices and gave BVB a try this week. It's a charming little place in its own way, with dark, moody lighting, 50's style black-and-white vinyl chairs, the entire menu written on a blackboard behind the bar in back, and one long side wall entirely covered in mirrors, upon which is scrawled the wine list. It's got the bohemian vibe down pat: everyone eating here isn't French, but they look and act as if they wish they were. There are no big surprises on the menu. Apps are mostly bistro mainstays like escargot, rillettes, pâté, soupe de poisson, and the like, with some less exclusively Gallic notes here and there like tuna tartare, scallop carpaccio and caprese salad. Mains are much the same: steak (a ribeye) and frites, scallops provençal, and lamb chops share space with chicken curry, spaghetti bolognese, and farfalle alfredo. We started with the fish soup and the rillettes. 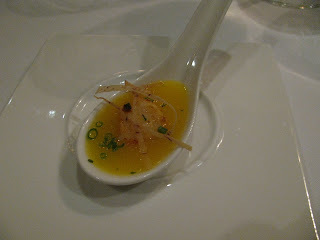 The former was a good take on the French classic, a murky, ruddy brown broth (this is not a criticism - prepared right, this is a frankly unattractive soup) well stocked with bits of fish and potently flavored with their extracted goodness. We pined, however, for the traditional accompaniment of croutons smeared with rouille and floated on the surface of the soup. Mrs. F tried her best to duplicate it with the nicely crusty bread that was brought to the table, but it wasn't quite the same. It seemed incongruous for such fine bread to be served with little single-serve pats of butter in plastic casings like you'd find in a Denny's. The rillettes were also a fine rendition, the slowly cooked pork tender and rich, served simply with some Dijon mustard and cornichons. The only drawback was that the rillettes were served so cold that they lost out on some of their potential for unctuous goodness - no doubt closer to room temperature these would be even more lovely. But this is still a hearty, satisfying appetizer which despite the dainty ramekin it's served in could easily be split among two people, and a good deal at about $6. Unfortunately I was somewhat less enamored with the rest of our meal. The tuna tartare Mrs. F followed her soup with was fine but unexciting in any way; the wakame salad which crowned it, redolent with sesame oil, was the overwhelmingly dominant flavor note. It also really could have used some sort of crackers or chips for scooping. I had the lamb chops as an entrée. They had been given a nice herbal marinade, but had been sliced so thin - before cooking - that getting them to only the requested medium rare was all but an impossibility. Rather than slicing these into 1/2" thick "chops" before cooking, they would have been much better served if the rack were left intact to avoid overcooking and then, if at all, carved before serving. I don't need a ton of food to be happy, but these four skinny chops seemed a slightly meager serving, though at a price of about $15 this is not a complaint about value. The mashed potatoes and ratatouille that came with the lamb chops were fine but would not inspire any homeward-bound correspondence. In an unusual twist, the by-the-glass prices on the wines generally seem a little more reasonable than the prices by the bottle, though the Julienas we had for $40 was a good value and a good wine, and there are a decent number of choices mostly in the $35-50 range. 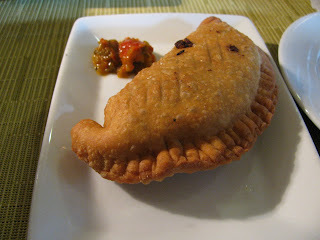 Despite being underwhelmed by some of the things we had, I can clearly see Buena Vista Bistro's appeal. I like its relaxed, laid-back atmosphere, and it's always nice to be able to find a meal cooked with care for a reasonable price. Ice cream machine! Ice cream machine! 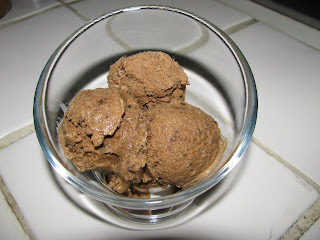 Yes, as warned, I decided it was time to break out the ice cream maker to deal with the black sapotes in last week's CSA bag. The basic recipe: flesh of two ripe black sapotes; 1 cup heavy cream; 1 cup milk; about 1/3 cup sugar (I happened to have sitting around some extra sugar which had been used to coat some candied orange peels, which was imbued with the scent of the oranges' oil, and used that); zest of one clementine. (I was aiming roughly for the flavor profile of the long-gone Baskin-Robbins mandarin chocolate sherbet, the odes of which I've previously sung). 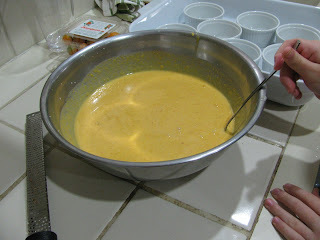 Mixed well to incorporate the sapote into the cream, chilled, and then into the ice cream maker. I'm actually pretty pleased with the results. The flavor of the sapote is perhaps somewhat indistinct, possibly because I'm not accustomed enough to it to recognize it. But there are some dark chocolatey notes, as well as some dark fruit notes like date or dried fig. The orange is not overwhelming but is noticeable and lightens up the flavor some. If I were to be generous, I might say the flavors are reminiscent of a port. I might try a little agar-agar next time to improve the texture. I tried it with a spoonful of arequipe, a Colombian dulce de leche type product with coconut that I found in the grocery store; not bad. 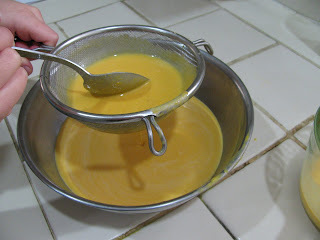 I may also try with some candied kumquats to up the chocolatey/citrusy quotient. The real test will come when I have the kids try it tonight. What do we have here? Green peppers, an eggplant, canistels (on the left; a fruit related to the mamey, also known as eggfruit since the color and texture supposedly resembles a hard-cooked egg yolk), bok choy, some adorable French breakfast radishes, green beans, komatsuna, and more betel leaves. Some of the green beans have already found their way into a pasta, along with last week's tomatoes and some fresh mozzarella. The radishes will be perfectly pleasant just with some good butter and salt. That's a lot of green peppers for someone who prefers red ones. Though I'd like to try something different with the betel leaves, the fridge already has all the fixings for bò lá lốt, so we may see a repeat performance (with either the bok choy or komatsuna serving as extra wrappers). And I'm doing my homework on canistels. Meanwhile, last week's black sapotes are looking ready to explode, which means they're ripe, and notwithstanding the chilly temperatures, I'm thinking they're going to become ice cream this time. What with holidays and travel I have sort of been falling behind, both in blogging and actually consuming some of my CSA share. For better or worse, a lot of this stuff is very easy to deal with though the results are not particularly notable. Greens get cooked down with some onions and pork products. Lettuces and tomatoes go into salads or on top of flatbreads. Those harukei turnips from last week (actually week before last now) are very nice as is; sliced thin they have a nice wet crunch like a daikon and a bit of a peppery bite like a radish. 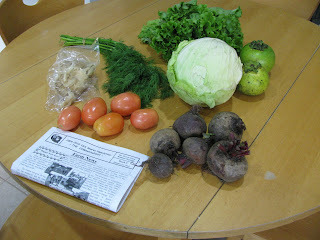 Week 5, pictured above, brought a head of cabbage, a head of lettuce, some beets, plum tomatoes (Little Miss F got excited for these and immediately started eating one like an apple), dill, oyster mushrooms (I think Mrs. F put these in a frittata) and more black sapote. Fortunately some of these items like the beets and cabbage are pretty hearty and seem to be coping well in the fridge despite my neglect of them. On an unrelated note, if you are accustomed to getting FFT through an RSS feed, I have switched from doing a full feed to just a short-form feed. Sorry for any inconvenience, but there is a website which is pirating my content without linking back to the site, without my permission, after being asked to stop doing so. So, in the hope that they "aggregate" this post as well: www.foodsherpa.com are a bunch of rude, thieving, copyright-violating douchebags. Please do not follow that link and reward their douchebaggery. That is all. Even a successful restaurant has certain inherent limitations on its profitability. You can only squeeze so many butts into so many seats. You can only increase your prices by so much before you wander beyond whatever particular niche of the dining market you've captured. So for many - particularly in this era of celebrity chefdom - at some point there comes the urge to grow, which means adding additional venues. There are at least a couple different approaches to such growth. Some restaurants take what I call the "clone and colonize" approach, bringing the same package to different regional or even international markets. 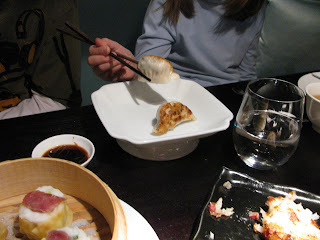 Nobu has restaurants in nearly twenty different cities in a dozen different countries. Joel Robuchon (after basically retiring from cooking) has restaurants in Paris, London, Monaco, Hong Kong, Macao, Tokyo, New York and Las Vegas. A plethora of chefs have set up satellite offices in Vegas, and over the past couple years the influx of "invasive exotic species" has made its way to Miami as well. Even Thomas Keller has gone bi-coastal with Per Se in New York, plus Bouchons in Las Vegas and now Beverly Hills. Other chefs stay closer to home, creating fiefdoms in their native territory. In Seattle, Tom Douglas has opened several restaurants all within a few blocks of his original flagship, Dahlia Lounge. 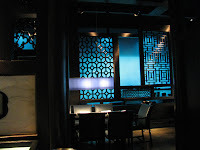 Here in Miami, restaurateur Myles Chefetz has done much the same thing on the "SoFi" (South of Fifth Street) end of South Beach with Prime 112, Nemo, Shoji Sushi, Big Pink, and the latest addition, Prime Italian. Jonathan Eismann is looking to do the same in the Design District, where he recently opened PizzaVolante a block away from his flagship Pacific Time and will soon be opening Q and Fin right down the street. (Of course some chefs follow both approaches: Mario Batali has his chubby fingers in nine New York restaurants, three in Las Vegas, and a few in L.A. too). Unlike the "clone and colonize" approach, which simply seeks to duplicate the same experience in a different venue, the "fiefdom" approach requires that there be something to distinguish one restaurant from another to reach different segments of the same geographic market. The easiest thing to do, particularly if you started with a high-end restaurant, is to do a lower-end, more budget-friendly place (note that David Chang did this in reverse, starting with Momofuku Noodle Bar and later opening the higher-end Ko); but then what? 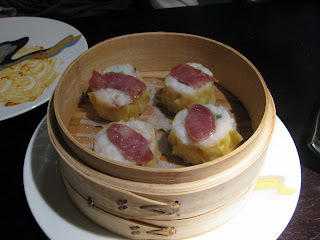 If you want to build an empire, the next step is to diversify the range of cuisines you offer. That's what John Besh has done in New Orleans. 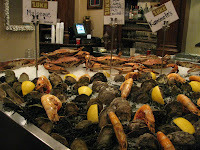 Chef Besh's reputation was made at his Restaurant August, which I'd loosely characterize as contemporary French in style with a strong influence from the Creole and Cajun cuisines and native ingredients of Louisiana. Riding the waves of acclaim for August (to say nothing of other favorable attention including a strong appearance in Top Chef Masters), Chef Besh now runs no fewer than a half-dozen restaurants in New Orleans. They range from the inevitable steakhouse, to an Italian restaurant, Domenica, to the one we visited, Lüke. It's a somewhat rustic looking place with a bit of a turn-of-the-century feel, featuring a long bar with carved wooden pillars, tiled floors, a pressed tin ceiling, and fans operated by a pulley-and-belt system supposedly invented in the 1880s. 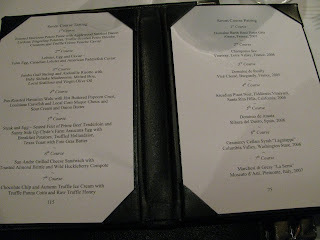 We showed up early for our reservation and so started our meal at the bar, where we sampled their custom-brewed pilsner and some items from the raw bar. The local P&J oysters were impeccably fresh and expertly shucked, and the Louisana shrimp were likewise fresh, sweet and tender. I generally prefer a smaller, tighter oyster like a kumomoto to a big sloppy one, but these were a happy medium - plump, firm and loaded with salty liquor. I might have hoped for something more adventurous to go along with them than cocktail sauce and horseradish sauce, but all they really needed was a squeeze of lemon anyway. 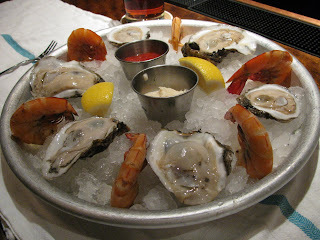 Both the oysters and the shrimp seemed like a remarkable bargain at $7 and $11 per half-dozen, respectively.